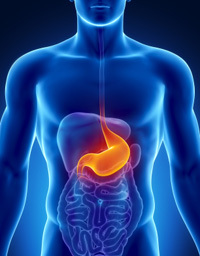 Both ulcers and gastritis involve destruction of the mucus layer that protects your stomach. The mucous layer is there to shield you from the hydrochloric acid the stomach produces to digest your food. If something happens to damage this mucous layer, or if is unable to replenish itself, the acid burns through to the stomach lining, causing a wound (ulcer) or inflammation of the stomach lining (gastritis). Severe stress can weaken the mucous membranes leading to the acid burning through. Some simple lifestyle measures to manage stress and making sure you have enough calming nutrients (eg. B vitamins, magnesium) in your diet can help you become more resilient to stress. Stress also leads to reduced production of glutamine, which helps maintain and repair your whole digestive system. In Asia L-glutamine is used to heal ulcers. Do you have H. Pylori? This bacteria is found in 80% of people with ulcers. 30% of people have H Pylori infection but only 10% get ulcers/gastritis. The bacterium secretes urease that produces ammonia locally and that reduces the acidity in the stomach, allowing H. pylori greater freedom to grow (it likes an alkaline environment). Eliminating the infection is important but so too is supporting the integrity (toughness) of the protective mucous layer. Non-steroidal anti-inflammatory drugs (NSAIDs) cause around 10% of ulcers. Paracetamol, aspirin and ibuprofen are examples of NSAIDs. Do you eat enough stomach-friendly foods? Inadequate intake of linolenic acid (an omega 3 oil found in flax, fish and pumpkin seeds) intake is associated with duodenal ulcers. Water is crucial for the health of the protective mucous membrane that line your stomach and oesophagus. Fruit juice, sugar and stimulants increase your need for water. Drinking milk raises the acid levels in your stomach within around 20 minutes. Therefore it’s best avoided if you are experiencing the burning pain or an ulcer/gastritis. Several large glasses of water are far more likely to ease the pain.